Over the past 18 months, the Federal Reserve has allowed "money" to become dangerously "tight." What I mean by this is that the Fed, whose primary job is to supply the market with a stable dollar, has allowed the real value of the dollar to rise by so much that it is pushing the economy into recession, forcing companies into bankruptcy, and causing mounting distress across the globe. 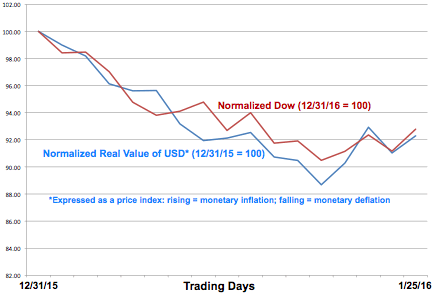 As shown in the following chart, the plunge in the equity markets during the first 16 trading days of 2016 can be explained entirely by the rise in the real value of the dollar during that period. Obviously, it matters a great deal how the real value of the U.S. dollar is defined and measured. This is discussed below. Note that I am not suggesting that there is currently any "shortage" of money. There is never a shortage (or a surplus) of "dollars," there is only a price (i.e., a real market value for the dollar). However, the economy needs the value of money to be stable. Large excursions in the value of the dollar (like the one that we have seen over the past 18 months) cause big problems. The problems produced by monetary inflation tend to be chronic (e.g., declining capital formation, malinvestment, impoverishment of retirees), while monetary deflation tends to create not only chronic problems, but also acute ones (e.g., market crashes, recessions, depressions). The price of money has the units "real stuff per dollar." Interest rates, which have the units "dollars of interest per year per dollar of capital," are not the price of money; they are rental rates for capital, borrowed by various entities, having varying credit ratings, upon various terms. At any given time, there are countless different interest rates, but only one real value for the dollar. Whenever you hear someone talking about monetary policy in terms of interest rates, you are listening to someone that doesn't understand the difference between money and capital. Unfortunately, their obsession with the Fed Funds interest rate puts Fed Chair Janet Yellen and the FOMC* firmly in this group. Money and capital are not the same thing. For example, although I am six feet tall, I am not the same thing as two yardsticks. Capital consists of physical resources of various kinds. Capital is measured in terms of money, it is mobilized by money, but capital itself is not money. "The dollar" is our unit of market value. Like our other units, "the dollar" has no physical existence. It is a concept, which should be a definition (but, since August 15, 1971, when President Nixon abrogated the Bretton Woods gold standard, has not been). "Dollars" are physical instantiations of "the dollar," just as a tape measure is a physical instantiation of "the foot." Dollars are used for commercial transactions within "The Extended Order," which is the name that F.A. Hayek gave our complex market economy, with its exceedingly fine division of labor and its decentralized decision-making processes. In addition to having a convenient way to do market transactions in the present, people and organizations also wish to have "liquidity." Liquidity is what gives people a sense of confidence that they will be able to meet their future obligations. The ultimate form of dollar liquidity is base (or "final") money. Under our current monetary system, this consists of Federal Reserve Notes and bank reserve account balances at Federal Reserve Banks. These are the only things that are actually dollars for legal purposes (i.e., for satisfying contractual obligations requiring payments in dollars). However, the desire for liquidity can also be satisfied by assets other than dollars, as long as people are confident that those assets can be quickly and easily exchanged for actual dollars without significant loss of value. Right now, things like T-bills, bank checking account balances, and money market fund balances are considered to be cash equivalents. Having adequate liquidity is very important to people. It is a vital element of "safety," which comes right after "physiological," in Maslow's hierarchy of needs. What used to be called "financial panics," and are now referred to as "financial market crises," are nothing more than mass panics over liquidity. The Federal Reserve was created to prevent (or, if necessary, stop) financial panics. At this task, the Fed has failed again and again and again (most recently in 2008 - 2009), largely because it does not understand liquidity, and what the real market value of the dollar is saying about the state of dollar liquidity. The Fed also does not seem to understand the close relationship between liquidity creation and capital allocation. · "Liquidity" does not exist in nature. It has to be created: somehow, somewhere, by someone. · Creating liquidity requires that someone issue liquid liabilities and put them into circulation by using them to buy illiquid (or at least less liquid) assets. This involves risk. · Economic growth requires capital investment in illiquid assets. Society as a whole wants to invest in profitable projects, but the people supplying the capital also want to maintain a comfortable level of liquidity. · Financial intermediaries (e.g., banks) exist to resolve the tension between return and liquidity. They collect part of the profit produced by capital projects in return for taking the risk of issuing liquid liabilities against illiquid assets. · Private, profit-seeking financial intermediaries do a much better job of allocating society's capital than do government agencies. · Anything that the Fed (or any other government agency, such as the CFPB) does to force private financial intermediaries to "reduce their level of risk" also reduces those entities ability to allocate capital and create liquidity. · Ironically, the risk that the Fed (and other government agencies) is trying to force the banking system to buttress itself against is the risk that the Fed will cause (or allow) monetary deflation (a rising real value of the dollar). Monetary deflation causes more-liquid assets to gain value relative to less-liquid assets, and pushes debtors (and, all financial intermediaries are debtors) toward insolvency. If this process is allowed to go far enough, the result is a "panic" or "financial crisis." · The financial markets exhibit "positive feedback behavior" with respect to changes in the real value of the dollar. This is because all of the actions that people take to protect themselves against monetary inflation tend to make the inflation worse, and all of the actions that people take to protect themselves against a liquidity crisis (monetary deflation) tend to worsen the crisis. · Accordingly, the monetary system is problematic in the way that a nuclear reactor is problematic. It is possible for it to "melt down," and it did so in 1920 - 1921, 1929 - 1933, and 2008 - 2009. · As a financial panic/crisis gets going, more and more assets that had been considered liquid suddenly become viewed as illiquid (or even worthless). For example, a classic "bank run" occurs when people become concerned about the liquidity and value of their deposit balances at a given bank. · Because dollars themselves (i.e., the dollars of the monetary base) are the only assets that cannot lose their liquidity (at least for the purpose of paying obligations denominated in dollars), the real value of the dollar tends to rise during a financial crisis. This serves to intensify the crisis. · If the Fed were to do its job, and always keep the real value of the dollar stable, it would not be possible for a financial crisis to occur. It is noteworthy that there were no financial crises during the Bretton Woods gold standard period, when the dollar was as stable in real value as it has ever been (more on this below). · However, once a financial crisis does start, the only way to stop it is for the Fed to create dollar liquidity on a massive scale-as much as it takes to force the real value of the dollar back to where it "should" be. Restoring the value of the dollar also restores more normal price relationships between asset classes, and thereby restores the solvency and liquidity of decently managed financial intermediaries. · Unlike what former Fed Chairman Ben Bernanke suggested in his recent book, The Courage to Act, there is nothing particularly "heroic" about the Fed stepping in to solve a problem that it created in the first place. · There are only two ways that the Fed can increase the total amount of dollar liquidity in the world: 1) buy illiquid assets (which involves risk to the Fed); or, 2) allow (or induce) other entities (e.g., banks) to buy illiquid assets (which involves risk to those entities). The Fed does not seem to understand this. If it did, it would never have started paying "interest on reserves" (IOR), which discourages bank lending (an activity that both allocates capital and creates liquidity). It would also have known that QE2 and QE3, which involved no risk to the Fed, and which resulted in no increase in bank lending (banks already had ample excess reserves prior to QE2 and QE3), would create no net liquidity. · The Fed was roundly criticized for the "bailouts" that it undertook during 2008. In a bailout, the Fed assumes the risk associated with illiquid assets, either by buying them outright, or by guaranteeing the liabilities of the entity owning them. The Fed apparently did not understand enough about its role to explain that, once the Fed had allowed the financial crisis to get going, there was no way for the Fed to stop it without taking on risk on a massive scale. No risk equals no net liquidity creation. · Fiscal "stimulus" (increased government borrowing and spending) creates net liquidity, but it does so by issuing Treasury securities in order to buy things that have little or no value (e.g., the services of unneeded government employees). In the case of "stimulus," the economic loss produced by misallocation of society's capital tends to offset any economic gain that might result from providing the economy with additional liquidity. · Fiscal stimulus is never needed to deal with a recession. The Fed has the power to create whatever amount of liquidity the economy needs (although it may be criticized for taking the risks required to do so). · Transferring the job of creating liquidity from private entities to the Fed (or the Treasury) also has the effect of transferring control of capital allocation to the government. Doing this has a huge cost to economic efficiency. In my view, the most useful indicator of the real value of the dollar is the CRB Index**. The CRB Index is the price index that was used in Figure 1 above. Because the CRB Index represents 19 commodities with output valued at $3 trillion/year, it is workable to assume that changes in the CRB Index reflect changes the real value of the dollar, which is the denominator in all of the prices that go into the index. Accordingly, if the CRB Index rises, it means that the dollar has declined in real value (monetary inflation), and that the Fed would have to reduce total dollar liquidity in order to restore the CRB Index and the real value of the dollar to their prior levels. If the CRB Index falls, it means that the real value of the dollar has gone up (monetary deflation), and that the Fed would need to increase total dollar liquidity if it wished to counteract this. Note that I am not asserting that the CRB Index represents the "true" value of the dollar, only that it is the most useful indicator available for the purpose of defining and managing the real value of the dollar. In other words, I believe that a monetary policy focused on the single objective of keeping the CRB Index stable at an appropriate level would yield a stable economy, stable financial markets, and the best monetary environment for capital investment and economic growth. I would argue that, if a CRB Index targeting regime were to be implemented today, the appropriate target level would be 300. This was (approximately) the CRB Index average in 2005, and it was also (approximately) the CRB Index at the end of June 2014. Increasing total dollar liquidity sufficiently to bring the CRB Index up to 300 would take the current deflationary pressure off the economy, but without creating significant monetary inflation. Weary of the economic stagnation of the past 15 years, during which real GDP (RGDP) averaged an abysmal 1.77%***, almost everyone now thinks of the 1950s and 1960s as the "golden age" of the U.S. economy. There are good reasons for this view. From 1948 to 1971, America's RGDP growth rate averaged 3.92%, unemployment was low, and the American middle class, as we now think of it, came into being. It is telling that, when judged by the CRB Index, the 1948 - 1971 period was when the U.S. dollar was the most stable, and the last 15 years (2001 - 2015) comprise the period when it was the least stable. 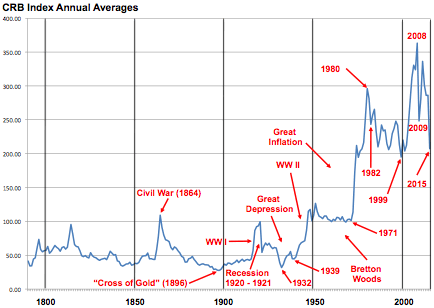 As shown in Figure 2, all of America's worst recessions (1920 - 1921, 1929 - 1933, 1981 - 1982, 2008 - 2009) were accompanied by sharp drops in the CRB Index (i.e., sharp increases in the real value of the dollar). This strongly suggests that if the Fed had created sufficient additional dollar liquidity to keep the CRB Index stable throughout those periods, these recessions would not have occurred. Conversely, there is no way that the "great inflation" of the 1970s could have occurred if the Fed had managed total dollar liquidity so as to keep the CRB Index near 100. Recessions seem to surprise and puzzle the economics profession. John Maynard Keynes put them down to waning "animal spirits." However, there is nothing puzzling about recessions at all. Recessions occur when people and business suddenly start buying less domestically produced goods and services than they did before. However, the reason that anyone buys anything is that they judge that the item in question is worth more than the money required to purchase it. If the dollar rises in real value faster than prices can adjust, then, on the margin, people will choose to buy less. In response to a more valuable dollar, American consumers will reduce their overall spending, shift their purchasing patterns (generally in the direction of "necessities"), and buy more imports, which have suddenly become less expensive. Lower sales will lead to mounting inventories. Rising inventories will cause U.S. producers to cut output, even while they increase foreign outsourcing in response to higher real labor costs. The foreign exchange value of the dollar will rise in response to its increase in real value, causing demand for U.S. exports to fall. Surprise-a recession. From June 30, 2014 to January 26, 2016, the CRB Index fell by 47.2%. This is equivalent to an 89.5% increase in the real value of the dollar over this period. This kind of rise in the real value of the dollar is what causes recessions, and it is all too likely that we are in a recession already. Unfortunately, the FOMC appears to be paying no attention to anything except the Fed Funds rate (which they are supporting at an artificially high level via IOR) and the U-3 unemployment rate, which is telling their Phillips-Curve-addled minds that we should be worrying about inflation. If we are to get from where we are now to stable growth, the Fed will have to start supplying the markets with the dollar liquidity that they are screaming for. If and when they do, this will cause the CRB Index to rise, whether the Fed chooses to use the CRB Index as its monetary policy target, or not. Of course, there is more to economics than monetary policy. True prosperity would require not only a stable dollar, but also lower taxes on savings and investment and a less burdensome regulatory regime. This having been said, stabilizing the dollar is the reform that would make the biggest difference to the performance of the economy. It is within the Federal Reserve's power (and mandate) to provide a dollar that is constant in real value (as judged by the CRB Index). However, to do this, the people running the Fed would have to understand liquidity. And, unfortunately, right now, they clearly do not. *The Federal Open Market Committee, which is the body that determines the Federal Reserve's monetary policy. ***Assuming that 4Q2015 RGDP growth comes in at the 0.7% annualized rate currently forecasted by the Fed's "GDPNow" model.